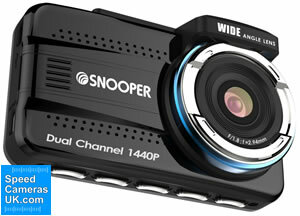 Snooper DVR-5HD offers a front and rear dashboard camera. Speed cameras are also available as an optional extra. There is also a 3-inch screen to instantly view recorded video. The 3 recording functions are continuous, event and parked mode. GPS technology also records speed, location and time stamp. The Snooper DVR-5HD is a front and rear dashboard camera which also features a 3-inch LCD screen to instantly playback recorded videos. The front camera has a 155 degree viewing angle whereas the rear camera has a 130 degree viewing angle. The DVR-5HD Snooper dash cam also has built-in GPS which records speed, location and time data and allows playback of your journey with Google Maps on a computer. Speed cameras locations are also available as an optional extra. Snooper DVR-5HD is suitable for day and night recording so you will never miss a moment, helping to make your journey safer by recording every moment. Recordings are made to the 32GB microSD which is included in the box. 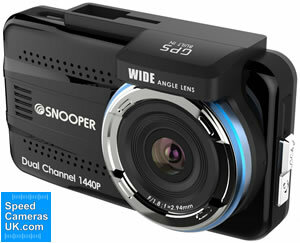 Snooper DVR-5HD will record continuously, recording over old video as the microSD card becomes full. There is also event recording made possible via the G-Sensor (recording starts when an impact is detected) and parked mode records video using motion detection and relies upon the built-in battery for power when in parked mode. When no motion is detected the DVR-5HD goes into sleep mode to save battery power. A microphone is also built in to the DVR-5HD to enable you to record sound such as spoken voice during an incident. Furthermore the Snooper DVR-5HD features a rear camera that records in 1080p Full HD to capture events in the road behind your vehicle. This is connected by a mini USB cable to the front camera where video is recorded to and stored on. Forward Collision Warnings and Lane Departure Warnings are also included. DVR-5HD users can receive up to 15% discount on new insurance premiums purchased through Adrian Flux. Adrian Flux provide insurance cover for cars, caravans, motorhomes, sports cars and more. The suction cup mount for the front dashboard camera rotates 360 degrees so that you can capture video from almost any position. 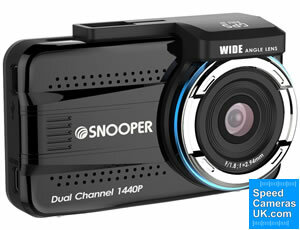 The Snooper DVR-5HD gets its speed camera locations via the Snooper AURA speed camera database. Updated daily, the AURA database can be downloaded to the device via a PC connected to the Internet with USB connection. It's important you regularly update, as the DVR-5HD GPS database is only as good as the last download. Countries included in the AURA database are: UK and Ireland, Germany, Holland, Belgium, France, Spain, Portugal, Switzerland, Italy, Austria, Luxembourg, Denmark, Norway, Sweden, Finland, Poland, Romania, Russia, USA, Canada, Australia, New Zealand, South Africa. ‣Collision warning and Lane Departure warning. Also includes Fatigue warning with reminders to take a break when driving long journeys. ‣Includes 32GB micro SD casrd in the box. Learn even more about the Snooper DVR 5HD by reading the manual. Click the PDF logo below. The manual opens in PDF format. Updates via Windows based PC. Please note: the Snooper DVR-5HD is not MAC compatible. To ask a question please click here. The Snooper DVR-5HD will only operate on Windows computers. Specifically, you must be using Windows XP (32 bit), Windows Vista, Windows 7, Windows 8 / 8.1 or Windows 10. Additionally the software will only work with Internet Explorer 8 or Firefox 10 or above. The Snooper DVR 5HD will not operate when using Windows 95, 98, 98SE, Millennium, Windows XP and Vista (64 bit) or Apple Macintosh operating systems. Please note: the Snooper DVR 5HD is not MAC compatible. Snooper DVR-5HD - What's in the box?